Most people know nettle by its sting. Nearby any clump of nettles you will usually find yellow dock growing. As children we would make a spit poultice of a dock leaf and rub it on the affected area for prompt relief. A plantain leaf works just as efficiently. Folklore advises us to grasp the nettle when we feel the onset of a cold to stimulate the immune system. Urtication is a term for self-flagellation with nettles to relieve the pain of arthritis. According to James Duke the tiny stingers act like micro-injections to deliver their anti-inflammatory constituents such as acetylcholine.¹ The stingers also contain serotonin and formic acid. Nettle leaves contain anti-histamines, and nettle tea is a very effective remedy for hayfever and similar allergies. They reduce blood sugar levels; improve circulation, tone up the reproductive and digestive system. As a tonic herb nettle benefits the body as a whole. 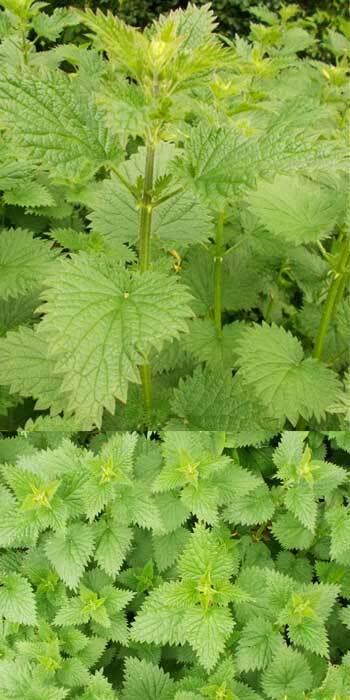 Stinging nettle has a square main stem with pairs of opposite serrated leaves and can grow to several feet in height. If you look closely you will see fine prickly (stinging) hairs on the stems and leaves. Tiny green flowers with no petals appear in late Spring to early Summer, forming clusters that dangle from the leaf axils. The male flowers have a 4-lobed calyx and 4 stamens, while the female flowers are either 2 or 4-lobed. They produce generous amount of seeds in late Summer to early Autumn. The leaves are best picked in early Spring when the shoots are under a foot in height. Henrietta Kress advises against eating old nettles as they contain calcium carbonate crystals which can irritate the kidneys.4 I sometimes reserve a prized clump for regular cutting back through to late Spring, just pinching off the tops. This encourages fresh shoots for repeated harvesting of delicate greens. Wear rubber gloves to protect your hands. Harvest only the nettle tops, the first 2 or 3 pairs of leaves. Separate the leaves from the stalks and rinse and dry in a salad spinner. Do not leave the leaves to soak in water, unless you want to make a nutritious plant food for your garden—if so, put the leaves in a pillow case, cover with water and soak 24 – 48 hours. Nettle leaves have a salty taste, similar to spinach they require only a minimum of cooking and seasoning. Try lightly steamed nettles tossed in olive oil with lemon juice or balsamic vinegar, minced garlic, crushed walnuts or pine nuts, and a sprinkle of powdered cayenne. Save the water for broths or nettle soup. My favourite is to make a raw pesto and preserve all their nutrients and medicinal benefits. Once they are washed, dried and broken down in a food processor or juicer there is no sting to fear. Make a tea of the fresh leaves, they taste great with crushed anise flowers. You can also dry the leaves to have a supply for the months ahead. The seeds can be harvested once they turn dark green and hang decidedly downwards. Cut the stems and hang upside down in bunches inside brown paper bags to allow insects to escape. Once dry separate the seeds and put through a sieve. Store your dried seeds in an airtight container. The dry seeds are a restorative tonic food for the kidneys and adrenal glands making them excellent for anyone suffering from stress or anxiety. You can add a teaspoon of seeds to your smoothie, sprinkle on meals or simply chew. For respiratory conditions soak overnight in red wine, about a teaspoon of seeds per glass of wine, strain, bottle and sip throughout the day. The fresh seeds are stimulating and recommended for people suffering from exhaustion. However be careful, start with a quarter teaspoon early in the day as too much could keep up all night. The yellowish roots are best harvested in the Autumn. They are strong and spread in long tangling rhizomes that break easily. Wear gloves and use a strong hand fork. Scrub the roots with a vegetable brush, they can be used fresh or dry. To make a decoction, simmer a handful of freshly chopped roots in a litre of filtered or spring water for 20 to 30 minutes. Add aromatics such as clove buds or cinnamon bark. Strain and drink, excess can be bottled and stored in the fridge. To dry the roots, cut into pieces a few centimetres long. Spread on a drying rack and leave to dry until thoroughly brittle, cut into smaller pieces and store in an airtight container away from the light. Use a teaspoon of dried crushed roots per cup. Nettle root is well researched and commonly prescribed for men in maintaining prostate health. They also contain the same tonic benefits as the leaves. Pulse until well blended and almost smooth. Serve with whole grain pasta, quinoa, on a baked potatoe, or as a dip or spread on sourdough bread or crackers. (1) Duke J. The Green Pharmacy. Emmaus Pennsylvania. Rodale Press. 1997. P. 55. (2) Kloss J. Back to Eden. 2nd edition. Twin Lakes USA: Lotus Press; 2009. P. 162.